A highly collectable splendid quality CARLTON WARE Large Pepper Pot manufactured between 1959 and 1961. 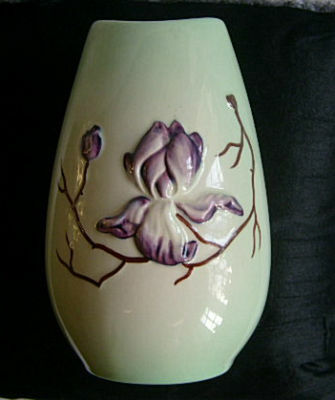 It is from the Australian Handpainted Magnolia Design of 1959. The purple magnolias are embossed on a pale green ground. It is completely unmarked and has no chips/nibbles. It measures approx 5 inches (13 cms) in height and the base diameter is 2.25 inches (5.5 cms).